Opening reception February 1, 6 - 8 p.m. I want the things I see and live with to be part of the imagery and sensation of the paintings-- perhaps to document my daily experience but also to chronicle the growth and decomposition that continues around me. Rick Wester Fine Art is pleased to announce an exhibition of new paintings by Alyse Rosner, a Connecticut based artist who has shown with RWFA since 2013. This is her fourth solo exhibition with the gallery. A Little Bit of Time presents Rosner’s latest fluid acrylic works, created exclusively on raw canvas, as she continues to explore the possibilities of scale in her work. 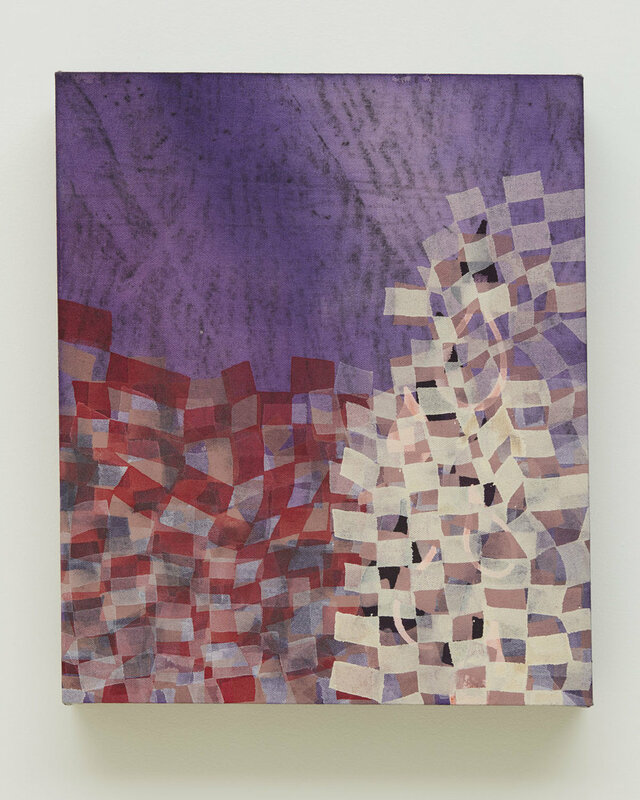 On the unprimed fabric, washes of color bleed and infiltrate each other, intermingled with a multitude of lines evoking textiles, corporal forms and implying a vaporous atmosphere. 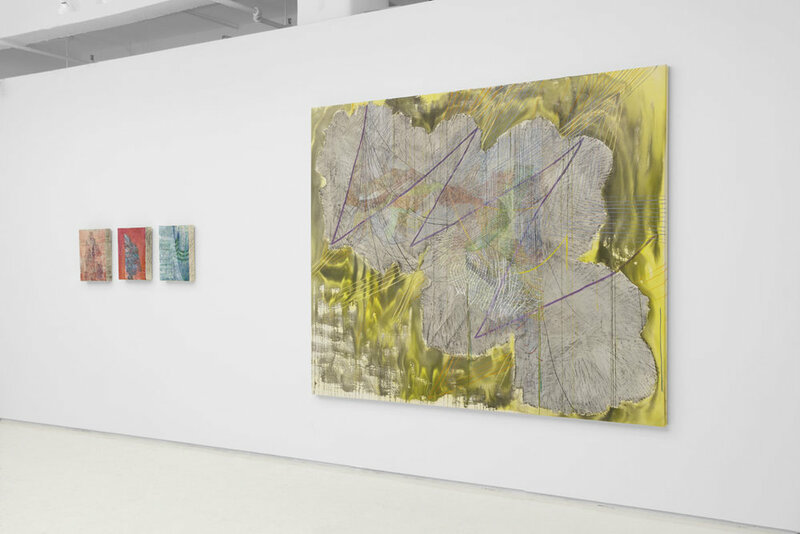 The dichotomy of large scale paintings, measuring up to 77 x 98 inches, created with intimate focus and detail, is animated by each layer of fluid acrylic paint and ink, applied at varying viscosities—from glittering transparent washes and drips of pigment, to floating opaque blocks and lines. In the language her drafting talents exclaim, these overlays act as focal points and visual references within her uniquely complex compositions: structural elements like the skeletons of ancient beings, only expanded in size and variety. Her underlying signature motif of graphite rubbings from the organic forms she finds near her home and studio has also grown. Now, along with the wood grain of the deck outside her studio, she employs giant leaves of sycamore and paulownia trees and the exposed surface of a shorn tree trunk found in her backyard, imbuing her work with a self-reflective, autobiographical theme, not unlike the Dutch Masters who incorporated mirrored reflections in their compositions. These environmental forms become the template for Rosner’s automatic drawings of natural designs, rendering a synthetic exploitation of gesture, line and color that absorbs and mimics the fragments of nature she employs. Rosner’s respect for the Earth and the environment is the leitmotif of her art (for years she painted on Yupo, a synthetic, resin based “green” archival material). These rubbings are the impetus and point of departure for each painting. Similar to fossils, they capture the impression of a living entity at a single moment. For Alyse Rosner, abstraction is the vehicle that carries her subtext of concern for a waning planet's ecology. In the past year, Rosner has been involved in several exhibitions across the United States. 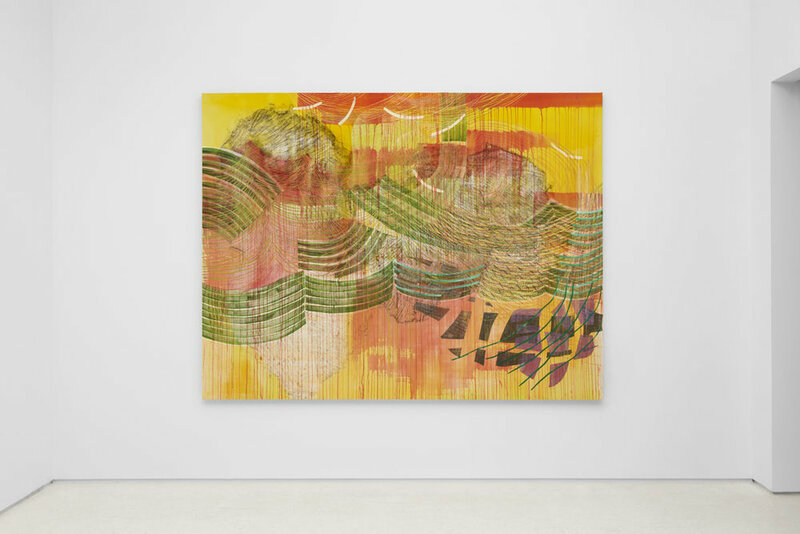 Her participation in the survey Unfamiliar Again: Contemporary Women Abstractionists at the Newcomb Art Museum of Tulane in New Orleans, curated by Mónica Ramírez-Montagut, established Rosner as a legitimate and conspicuous figure in an art movement centered on new abstraction. Just recently closed, she was also one of only three artists chosen for Venus Fly, curated by Tracy McKenna at the Flinn Gallery in Greenwich, Connecticut, a hidden gem of an exhibition space. 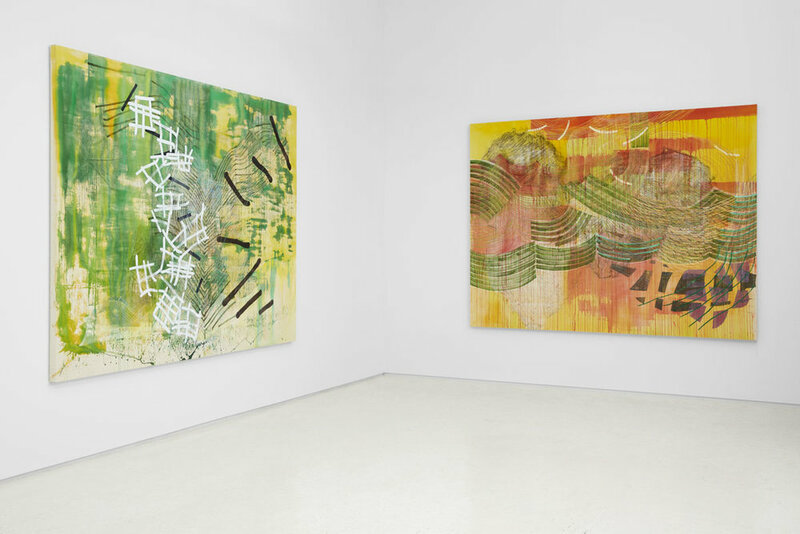 Other exhibitions in the past year included Excessive Frugality at ODETTA in Brooklyn, a group show featuring the byproducts or the source materials of the creative process, as well as Bigger Bolder Better, a Chashama exhibition inspired by the 2017 Women's March including site specific work by 15 artists installed in a 7000 square foot space in Brooklyn. 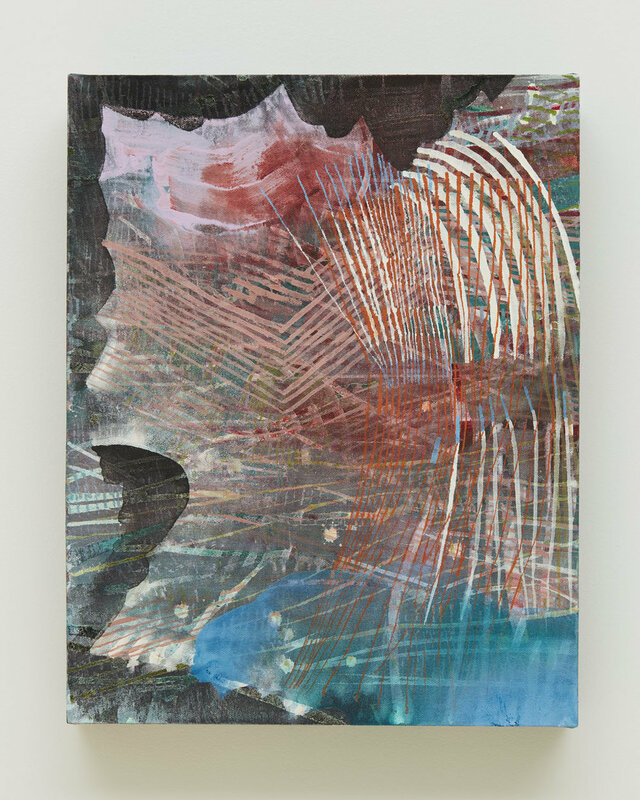 At RWFA, Rosner was included in Tremolo, a group exhibition curated by Carolanna Parlato exploring vibration, movement and the underlying anxiety inherent to contemporary art.